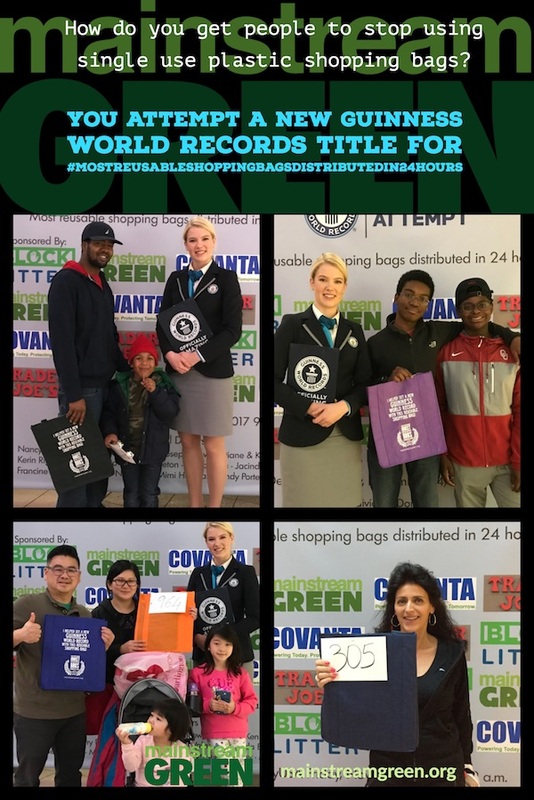 No GUINNESS WORLD RECORDS™ title this time – Mainstream Green, Inc.
On Friday, Nov. 24, 2017, Mainstream Green, Inc., the environmental non-profit, led an attempt to set a first ever GUINNESS WORLD RECORDS™ title, Most reusable shopping bags distributed in 24 hours. The group needed to distribute 5001 bags to snag the title. They came up short. 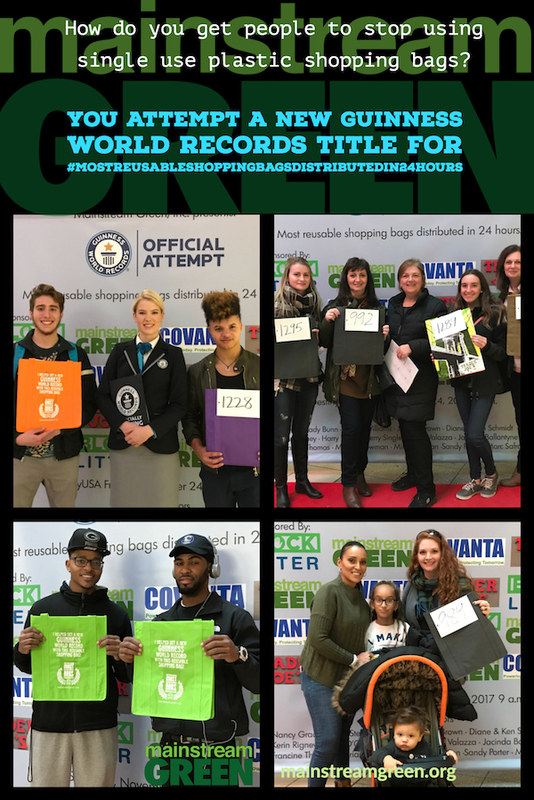 "Our volunteers put on a tremendous effort to achieve the first ever GUINNESS WORLD RECORDS™ title but we were short of the 5001 bags required by Guinness," announced Dana Johnston, President of Mainstream Green, Inc. "However, in this process, we learned enough to think that a second attempt, at a different location, on another date, with a different algorithm will succeed." This is the first time on Planet Earth that the title was attempted, as it was invented by Ms. Johnston, and then approved by the Guinness World Records officials. However, the number set as a requirement by GWR to achieve the new title, 5001, is now under some scrutiny by Mainstream Green, Inc., as the group's research subsequent to the event appears to show that the basis for that quantity is incorrect information. The Mainstream Green Board of Directors is reported to be planning to address that issue with GWR before the next title attempt. "We are very grateful to our volunteers and supporters, and we want to give an enormous thank you to all the dozens of people who helped us along the way," said Dana Johnston. "The event was a great success," she added, saying, "People really knew they were part of something special, and were having a lot of fun with the whole Guinness thing, and posing on the red carpet for selfies. We received wonderful media coverage, along with good social media buzz, which clearly went a long way towards encouraging greater use of reusable shopping bags and raising awareness about the harmful effects of plastic bag pollution. 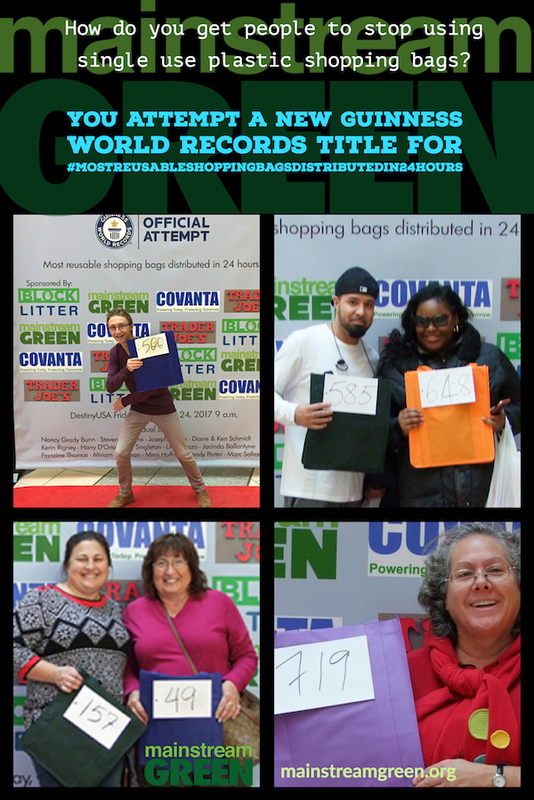 "What's best about what we did with our Guinness World Records title attempt is, the value of this event doesn't end with this one day, because some 1500 Central New Yorkers will now be walking into Trader Joes, Aldi, Costco,Wegmans and other stores with the shopping bags they got here today. 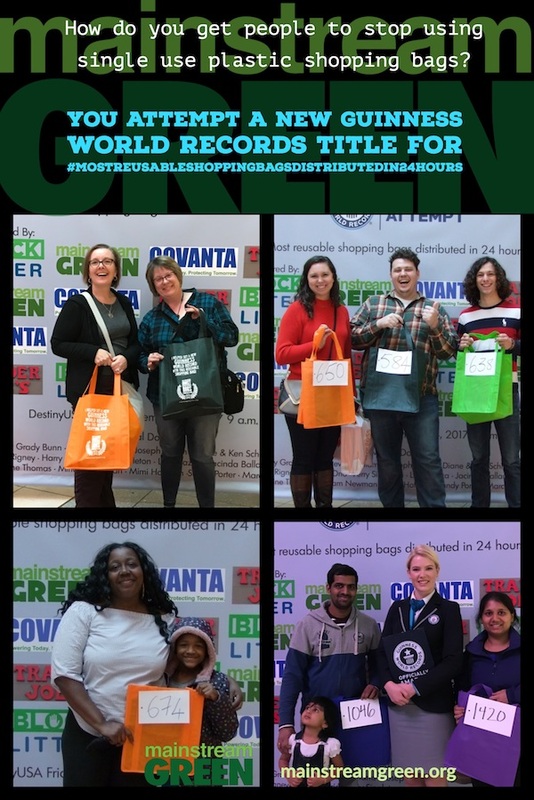 Every time they take our bag into a store, scores of people will see our bags with the words 'Guinness World Record' and "Reusable Shopping Bag" and they'll get the message again and again and again -- for months!" Mainstream Green's volunteers learned some fascinating facts during the bag giveaway. "We found out which colors of reusable shopping bags consumers prefer," reported Gayle McCabe, a Mainstream Green volunteer. "Almost all women and some men preferred very bright, vibrant colors to dark colors. And the most requested color was purple!" Mainstream Green is asking the many Central New Yorkers who took an interest in this, to join them in a second attempt in 2018. Guinness World Records Title. Bookmark. Finally! a Reusable Bag You’ll Want to Keep & Use!